This post is inspired by another blogger - Alice over at Of Books - who shared a list of ten books she would take if moving country. Alice's post really got me thinking about what ten books I would take from my collection if I were to make a move, and it was no easy feat narrowing it down to just ten - it's kind of like picking your favourite books. I'm not typically one for romance novels, but Pride & Prejudice is so much more than a romance novel. I find it hard to express my thoughts on P&P exactly how I think of them in my mind, but just know that it is one of my all time favourite classics. Another of my favourite classics, Jane Eyre would have to be packed up along my belongings if I were ever on the move. 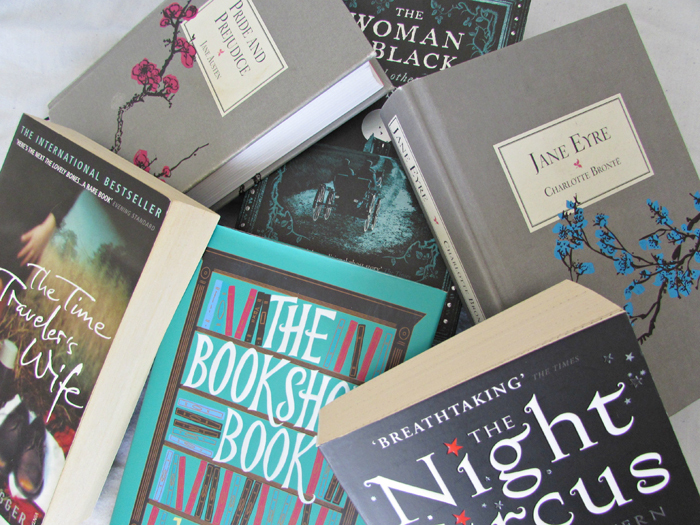 There is so much that goes in to the story of Jane Eyre, and I love a good gothic classic. If I could only recommend one book for the rest of my life it would be The Night Circus, seriously, if you haven't read it already then you're missing out on a beautifully written story. Like, beautifully written!! There is a lot of description within The Night Circus which allows the settings, surroundings, and circus itself to form before your very eyes. The only non fiction book to make my list of ten, The Bookshop Book is written by Jen Campbell and showcases a number of quirky independent bookshops from around the world. There are some really touching stories within The Bookshop Book - its a must for any booklovers shelf. At one point in my life, I would have told you how The Time Traveler's Wife was my favourite book of all time. I've read many a book since then, but it's still up there as an all time favourite. The plot is layered, very complex on first reading, and really quite an emotional read. I'm quite a mood reader, but also a seasonal reader too, and so I had to have a winter read on this list. There are a number of books that I like to return to during the winter months, but one whose message has stayed with me ever since first reading is The Gift by Cecelia Ahern. I love fairy tales, and whilst there are many compilations out there, Angela Carter's is definitely my favourite. The book is quite a hefty one, but she has taken a number of fairy tales from various parts of the world and compiled them by theme, presenting a wonderfully in depth and well thought out collection of fairy tales. I Capture the Castle was one of those book purchase whims, but the minute I delved in I was instantly in love with the story of Cassandra - it is such a whimsical tale. If you're a regular reader of my blog then you'll know I bang on about The Woman in Black far too much, you're probably sick of hearing about it, but naturally it would feature on this list. The Woman in Black is a subtle but atmospheric ghost story, and a yearly reread for me, hence why it would need to come with me on a move. Patricia Highsmith would be considered an author I recently discovered, but her work is renowned within the crime fiction genre. I've only read a handful of her books now, but her writing is amazing and I'd happily take any of her books with me... In fact it was hard to narrow it down to one. What ten books would you pick? This is a tough one! I'm not sure I could narrow my stacks down to 10. I love your list! We saw The Woman in Black as a play and it was so good and absolutely terrifying. I never knew a play could be scary until that one. The Bookshop Book and I Capture the Castle are books I absolutely must read. They've both been on my TBR for quite some time and they sound so great. I've seen The Woman in Black in the West End twice now, and it blew me away both times- such a creepy and atmospheric play! Oh, you have to read The Bookshop Book. I'm trying to push it on every bookish person I know. Haha! This is great!! I have a copy of The Night Circus and have yet to read it. I know, it's terrible!!! I want to soon! It's sad, but I'd probably just grab all of my Colleen Hoover books if I could only take 10. Or at least the 10 favorites of hers, which is hard to pick. Lol. Ah, you've got to read The Night Circus at some point - it's such a beautiful book. I know some people don't enjoy it all that much, but I think it's the kind of book that has to be experienced the once at least. It makes for great A/W reading. Haha! That isn't sad - it says a lot about Colleen Hoover's writing, and definitely shows how much you enjoy her work. It also tells me that I really need to pick up one of her books!! Oh wow that is tough!!! I actually just bought Pride and Prejudice because I somehow have never read it! I did really enjoy the Night Circus and The Time Traveler's Wife. I think some that I would take would be Attachments, The Catcher in the Rye and Tell the Wolves I Am Home. And probably something fluffy and upbeat too! Great post! I hope you enjoy Pride and Prejudice - there are so many classics out there, it's understandable to not have read it really. The Night Circus and The Time Traveler's Wife are literally two of my all time favourite books. I could read them again, and again, and again. It sounds like you'd have a good mixture of reading material in your list of 10 - I really need to read more of Rainbow Rowell's books; I've only read Landline. This would be a tough decision!! The only one for certain I can name instantly is Watership Down, my absolute favorite book of all time. I love I Capture the Castle! I was thinking about picking it for book club this summer, maybe. Also Jane Eyre - a favorite as well. You know, I've never read Watership Down. I'm not entirely sure why, as it is a book I hear of pretty frequently. I Capture The Castle would make such a good book club read - do it! What a fun topic! I would definitely take all my Harry Potter books, but I don't know what the other three would be! "The Bookshop Book" is on my to-read list, or at least it was at some point, but I had forgotten all about it. If you love it enough to put it on your list, I'll have to take another look at it. Patricia Highsmith is a newer discovery for me too. I haven't read any of her books yet, but lately I notice her name everywhere. I had to eliminate my HP books from the selection, because just as you would, I'd take all seven and I'd be severely limited in what else to include! Oh, The Bookshop Book is well worth taking a further look in to. I'm basically a book pusher, telling all and sundry to read it! I don't think any book lover could come away from that particular title disappointed. You've got a great selection here - I Capture the Castle!!! How could I have forgotten that. Thanks for the inspiration, Alice.